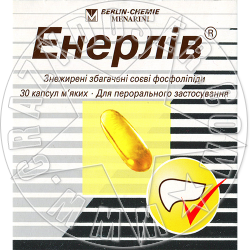 Excipients: mono-, di- esters of fatty food acids and glycerol, triglycerides medium chain, refined soya oil, alpha-tocopherol, gelatin; 85% glycerol. Fatty degeneration of the liver (including liver damage in diabetes), acute and chronic hepatitis, cirrhosis, pre- and postoperative treatment with surgery of the liver and biliary tract, toxic liver damage, pregnancy toxicosis, radiation syndrome. Adults and children over 12 years. The initial dose is 2 capsules Enerlivu â 3 times a day and maintenance - 1 capsule 3 times daily. The drug is used during eating, not chewed and washed down with a sufficient amount of fluid (eg a glass of water). The recommended duration of treatment is at least 3 months. 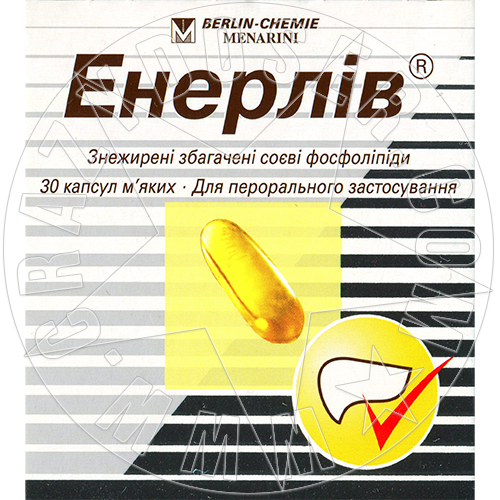 Reports of overdose Enerlivu â or intoxication it has not been reported.